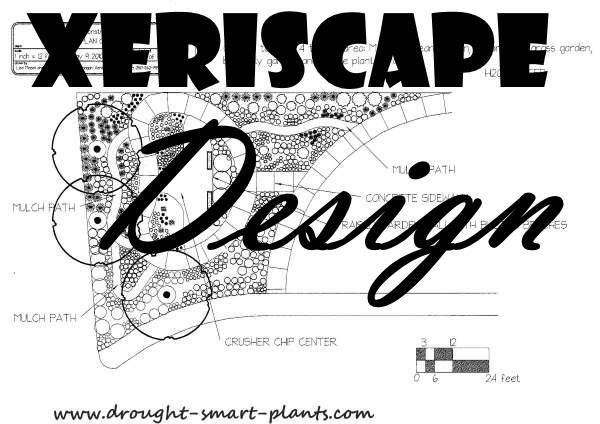 Planning your garden to be water wise is the most important part of xeriscape design, second only to focusing on your xeric garden style which will guide your choices. Xeriscaping is a word meaning xeri - dry, and 'scaping - landscaping. In our unreliable climatic conditions of changing rainfall and drought patterns it's getting more and more important to be pro-active and design for the worst case scenario. Rainfall can be sporadic or non-existent, or go the other way entirely and be of monsoon-like proportions. So, what kinds of things are important? First of all, it's important to figure out what plants will grow in your conditions. Positioning those plants that require more water near the house or a hose bib, will make them easier to care for. Plant in zones, so that the plants that need more moisture are clustered together. It makes sense to group them ecologically, as you can tailor the soil, mulch, and irrigation to fit their needs. Capture water off roofs for use in your xeric garden to reduce the water required from city supplies. 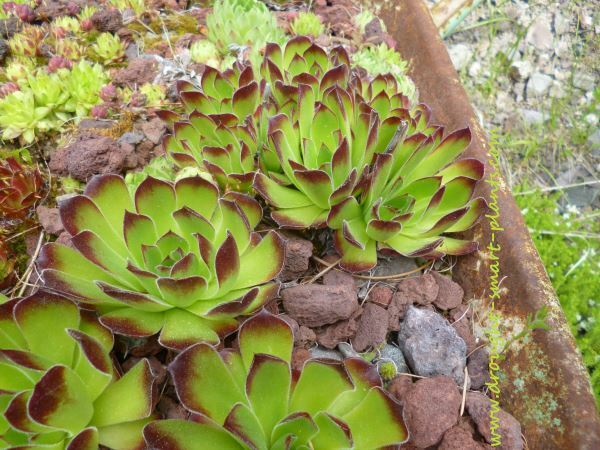 See my recommendation of the 10 Best Succulents for Landscaping, and reduce your water consumption to almost nothing. Install drip irrigation systems to conserve water and prevent excess evaporation. Rain gardens are a perfect way to ease the burden on the garden hose, and the gardener. Design your xeriscape to place high water demanding plants in zones where they will be watered by rainfall directed off your roof. This means you can still grow those plants that need more moisture, but they'll be much easier to care for. Further away from the house in ever increasing circles can be those plants that either don't require high moisture levels, or will die if over watered. Your xeriscape will be an intriguing mix of hardy succulents, classic perennials and drought tolerant plants, mixed and combined in a lovely colorful tapestry. Where should the plants go? How do I decide? and grading also play a key role in developing the xeric garden. Hardscaping refers to those elements in the design that are not plants. Patios, walkways, decks and rock retaining walls are typical examples. Grading to change the way water flows across your land will eliminate standing water which will attract mosquitoes, or water that cascades into your basement. Build swales (shallow ditches), a dry streambed or berms (slightly raised areas) to direct run-off to areas that need more water such as a ecosystem pond or bog garden. Once these parts of the design are determined, you can figure out where to put the plants; Planting in drifts and groups are much more effective than in straight lines, or even worse, dotted around like polka dots. spiky and short groundcovering types can be grouped where you can look down on them and marvel at their texture. Adding compost your soil and mulching, as well as choosing those plants with drought smart strategies are great ways to have a successful xeric garden. Using these general principles in designing your xeriscape can be challenging, but the end goal is to make it easier to have a beautiful garden with less maintenance and water input.